And the writer in me suddenly wonders, when did the grown-up me lose the wonder and excitement that comes with a snowfall? Especially the first one of the winter. Yes, it makes my work life miserable, and possibly dangerous if I have to drive in it, but when did I stop seeing the beauty in another one of God’s gifts? 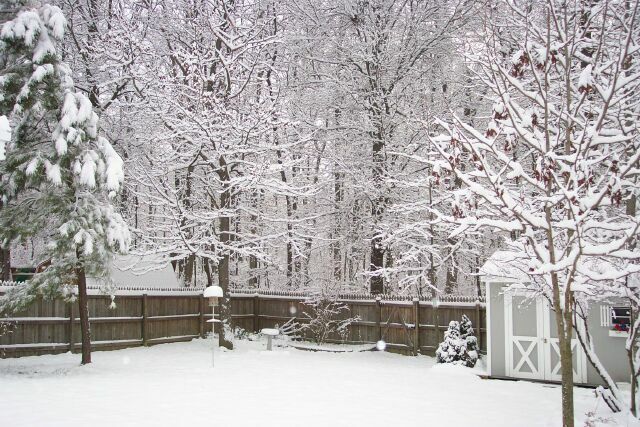 “He spreads the snow like wool…” Psalm 146:16. When was the last time I actually stopped and thought about the beauty of it all? When snow blankets the world around us and makes everything look clean and fresh…a glistening cover of sparkling diamond-like beauty. Like a new canvas ready for paint, or a blank page ready to be filled with words to a story not yet written. It’s a new start…a new beginning. When was the last time you just stared out the window at the new fallen snow in amazement, and even wonder, at the beauty and the stillness…the quiet that only a fresh snowfall can convey? The world, for just a few minutes, at least outside your window, is changed. There’s total peace. No one has yet disturbed the blanket of sparkling whiteness, and for just a few minutes, you wish it could stay just like that. And when was the last time you thought about how no two snowflakes are ever exactly the same? The Lord takes His time to make each one individual, each one different. If he takes His time to do that for the millions and billions of snowflakes that fall during each storm, shouldn’t we take the time to appreciate it? Take the time to grab a cup of coffee, sit by the window, and watch the flakes softly fall, each one adding just a tiny bit more depth to that soft blanket covering all of the “junk” outside. Discarded flowerpots and yard tools disappear, and no longer remind us we still need to put them away. 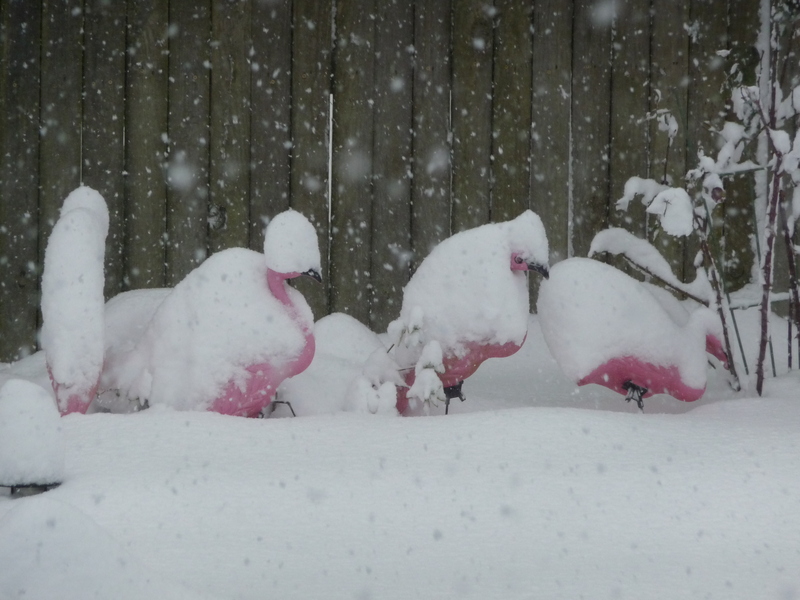 In my case, during the last snow I watched my backyard flamingos just barely keeping their pink heads above the rising thickness, and wished I had some little sweaters and scarves for them so they wouldn’t be cold (they’re plastic, for heaven’s sake!). Obviously, snow is another of His gifts to us, possibly at a time we need a change, or a new start on something, or to get us to just slow down and one again appreciate the beauty in the world around us. He sends the snow to remind us it’s never too late to start a new canvas, or a new story. And because the snow makes traveling a bit difficult, He’s also reminding us to slow down, look around us, and see what we’ve been missing in our face-paced and stressful lives. But this new canvas doesn’t stay blank for very long. The world intervenes, and tire tracks, snow plows, footprints, and shovels take over. Schools are closed, and snowmen of all sizes and shapes pop up in almost every yard. Parents and children find the nearest hill, even if it isn’t very big, and race down on sleds, boogie boards, and trash can lids. And a new story has been painted in that blank canvas. What story are you going to paint, or write, if you get a snowy canvas to work with this weekend? Well written and such a good reminder for us to slow down and enjoy God’s gifts of beauty.